Evelyn Conley and Felicia Olaya will be scheduling time for me to spend in the communities within the 14 counties to do home visits and meet with officials in the area. 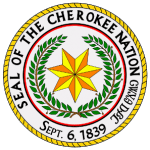 Melissa McNiel and Dana Teague are coordinating Cherokee Nation sponsored Candidates Forums to be held in Cherokee County, Delaware County, Sequoyah County, Adair County and Mays County. Dates are pending at this time. I want Council to have the handbook given to all conference participants representing many Cherokee communities within the 14 counties. Education, Green Matthews Fund Scholarship Recipient, Connie Page. This is a full tuition scholarship for Cherokees ¼ blood or more that are pursuing graduate studies in environmental science. Connie saw information about the scholarship on our web site and got the scholarship. She was already in her second year pursuing a Ph.D in environmental science from the OSU-Tulsa. We’ve got the scholarship applied retroactively to last year, and it will help her through the remaining work toward her Ph.D. She currently works on an environmental project near Round Mountain as one of her three jobs. Connie has a Masters Degree in biological science, and a law degree from Tulsa. She’s here tonight. Dental Awards -The Cherokee Nation’s dental clinics and clinic staff were given top recognition by the Oklahoma City Area Indian Health Service during the area’s annual dental meeting. The Redbird Smith Clinic was honored for clinical productivity. The Jay clinic was cited for clinical efficiency and Joan McCarty was recognized as the Outstanding Dental Assistant Supervisor. Dr. Bob Crittenden, Dr. Matt Warlick, Patsy Vann, Candace Roof, Tonya Dearman and Jamie Rose of the Wilma P. Mankiller Health Center in Stilwell were given awards for outstanding efforts in data collection for an oral health dental survey. Defibrillation Distributions – Six area volunteer fire departments have new equipment that may help them save the lives of heart attack victims. The Cherokee Nation donated defibrillators to the Sparrow Hawk Village, Norwood, Hulbert, Flint Ridge, Kenwood and Leach fire departments because their volunteers are often the first to respond to emergency calls. The extra few minutes that a first responder gets makes all the difference. Ninety per cent of the time, heart attack victims can be resuscitated. That’s why it’s so important that these first responders in rural areas have this equipment. Walking Shield American Indian Society and LensCrafters Foundation – Staff and volunteers worked through the heat last week at Redbird Smith Health Center to donate glasses to Cherokee students, ages 5-21. LensCrafters’ Vision Van, a 40 foot long mobile eye clinic was equipped to provide the exams and dispense the glasses. A group of volunteer eye care providers from across the US donated their time in this tremendous effort. It takes many people with various talents to accomplish a project like this. I want to thank our employees who worked hard to coordinate this effort, especially, Donna Gourd, Regina Christie, Wynema Bush, FriedaThompson, Vic Moses, Linda Brooks, Buddy Holt and Jennifer Scoggins. This program provided free eyeglasses and exams for more than 500 Cherokee children. Two months ago I appointed Darell R. Matlock, Jr. to the Judicial Appeals Tribunal. I understand that Mr. Matlock has been invited to appear before the Rules Committee on Thursday, July 20, 2000 @ 5 p.m. Thank you Chairman Cooksey for your assistance. Councilor Dorothy McIntosh sponsors Mr. Matlock, and I hope that Council will confirm his appointment. Mim Dixon, Executive Director of Health Services – Mim was director of Chief Andrew Isaac Health Center in Alaska and has done policy work for the National Indian Health Board. David Roberts, Director of Cherokee Nation Marshal Service – A Cherokee Tribal Member, David has nearly thirty years of distinguished law enforcement experience and service. Last month I did veto Resolution 32-00, concerning NAHASDA funding. On June 19th, I sent Council a message outlining the reasons for the veto. Before going into the details of that message, let me say a few words about my responsibility to veto legislative enactments when necessary, my duty to set forth the objections in writing, and my desire for Council to consider an alternative. Unquestionably, the Tribal Council (Legislative Branch) is the law making body of the tribe. However, the Administration (Executive Branch) is charged by the Constitution to carry out the laws. I have in the past two months vetoed legislation not because I didn’t like it, but because I thought that clauses within the legislation were unconstitutional. If I think that there is a constitutional question on a bill, I do not have the opportunity to make changes. I can only sign the bill into law or veto it with a statement of my objections. It is always my hope that differences and concerns can be resolved through a well defined legislative process and good communication. Rescind Resolution 30-00, which is currently in effect. Remove the clause that would “authorize the hiring of any and all personnel” etc. and using NAHASDA funds for reimbursement. (Like any other funds of the Nation, expenditures should be made from appropriated and budgeted funds, and there has not yet been an appropriation or a budget of any NAHASDA funds. I hope Council will consider this alternative way to reach an objective that both the Council and the Administration agree upon.